Kingston Brass Frosted Glass Vessel Bathroom Sink w/o Overflow Hole EVSPFC1: This Frosted Glass Vessel Bathroom Sink is built to last. The highest quality standards are used to precision manufacturer a top of the line product. Important features of this BRAND NEW Fixture: Complete Item! Everything necessary for installation is included. 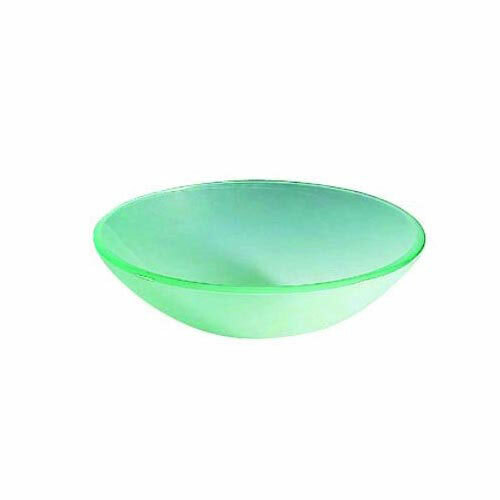 Matching Accessories Available - Easy to Install - Installation instructions included - Frosted Glass Vessel Bathroom Sink without Overflow Hole - 1/2-inch thick green frost glass design will turn any ordinary bathroom into a perfect modern space with perfect harmony of elegance and style. - High chemical and thermal shock resistance - Stain resistant and easy-to-clean - Standard 1-7/8-inchárecessed drain hole - Closed plumbing surface view - Drain not included - Clear Frost Finish premier finish designed to resist fading and tarnishing. This fixture is manufactured by Kingston Brass and is part of their Templeton collection. 1/2" thick green frost glass design will turn any ordinary bathroom into a perfect modern space with perfect harmony of elegance and style.